Two letters appeared in the Lutheran and Missionary in the late summer of 1864 signed, "M.L.S." The summer session had ended at Pennsylvania College. The campus was quiet, the classrooms were empty. For professors at the college, the brief breaks between semesters were a much-needed respite from the daily grind of professorial life. Any sane professor would use the few brief moments to unwind. But for Martin Luther Stoever, who had begun the war as a simple professor of Latin, Literature and History, too much had gone by to sit idle. Witnessing the work of the United States Christian Commission in the month after the battle of Gettysburg, operating out of the vacant store on the first floor of his home, Stoever saw firsthand how Christian precepts might ease the pain of the suffering soldier. By 1864, Stoever was heading up Gettysburg's new local chapter of the Christian Commission, organizing supplies and coordinating donations. But in the summer of 1864, he might have done more. During Pennsylvania College's break that summer, an aid worked arrived on the outskirts of Petersburg, Virginia. "You will no doubt be surprised to receive a letter from me at this point," the correspondent opened. "I have been here for some days, among the wounded and the dying." Martin Luther Stoever had seen suffering on a battlefield before. In the months after the battle at Gettysburg, Stoever moved from field hospital to field hospital, aiding the wounded and praying with the dying. The letter in the Lutheran and Missionary noted all of the valorous shows of courage by the Federal soldiers as they suffered after the assault on the Weldon Railroad. TIn their sufferings, these men were, "showing the spirit of our noble soldiers who are willing to endure so much for the cause of freedom. It is a costly sacrifice. Many victims are required to secure the end. But it is only through tribulation, that great results are achieved." Before the war, Martin Luther Stoever made a last ditch effort (as did many Americans) to stave off war. He signed a set of petitions from citizens of Adams County supporting compensated emancipation and forced colonization. America's sundry colonization societies were the most lackluster of abolitionist, believing that black shouldn't be slaves, but also shouldn't be Americans. But something shifted for Stoever as the war dragged on. 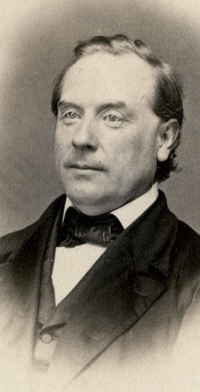 In 1864, the correspondent to the Lutheran and Missionary noted he was, "very much interested in what I saw of our colored troops. They are noble, brave men, their hearts earnestly in the work, and many of them sincere Christians." One he met was from nearby Hagerstown, Maryland and knew some of the author's friends. When questioned whether he was afraid of battle, the black soldier responded resolutely, "No! God will take care of me. When I started in defence of my country I determined to stand by her till I died." "This," M.L.S. noted, "is the spirit which I have seen exhibited by many of these men. God, in his wondrous providence, is doing marvellous things by means of this war... One of the results will be the elevation of the African race, in the confidence it has isnpired in themselves, in making them, as well as others, feel that they have capacities, that they are immortal beings, that they can accomplish something for the good of their fellowmen." The following year, when Abraham Lincoln was murdered by a bloodthirsty zealot, Professor Stoever confessed in a eulogy to Lincoln that, "we must now admit, even if we did not before, that there is a barbarism in slavery." 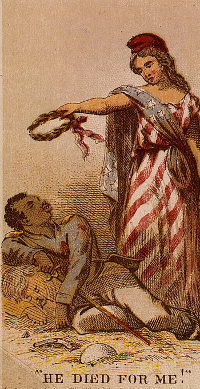 Slavery, made incarnate in the rebellious Southern nation, had, "showed its real character in the various atrocities committed during the war, in the heartless treatment of our prisoners, in the brutal massacre of our colored troops, in plotting arson, in attempting to diffuse malignant disease, in commissioning its secret emissaries to burn and pillage our large towns and cities, in striking at every thing that opposed its progress and perpetuity, and crowned its wicked career in the perpetration of a crime unknown in our history," the murder of the President. It is a duty, then, we owe to the memory of the illustrious dead, that this evil be utterly eradicated, that the letter and spirit of the Emancipation Proclamation, be fully acknowledged and faithfully executed; that domestic slavery be forever obliterated from American soil, that the great principles which underlie our Government be vigilantly guarded, that hereafter all, who live beneath the folds of the American flag, be protected in their inalienable rights and treated as freemen, and every human being occupy the position assigned him by his Creator." Something made that historian's mind shift and change, morph and progress. Perhaps that something was a trip south in 1864, and an opportunity to see black men fighting valiantly for their nation, and kindly shake their hands. Very interesting. I think there's a lot more going on here, too, as Stoever did some important historical work transcribing Muhlenberg's diaries in the 1850s. I should look to see how Stoever weighed in on the American Lutheran vs. Old Lutheran debate that raged in the 1840s-1860s. Paul Kuenning's 1988 Rise and Fall of American Lutheran Pietism accuses the Old Lutherans -- the viewpoint represented in the Lutheran and Missionary -- of cowardice and quietism on the issue of slavery, although I think he advances a narrative not supported by the evidence. Regardless, the evolving personal views of Stoever could be a very important data point in understanding the debate. Do we know Stoever's relationship with Schmucker and the Krauths?